Having multiple Amazon accounts can get pricey, if you pay for Prime multiple times, buy the same movies, and so on. Thankfully, Amazon Household makes it dead simple to share free shipping, purchases, and other benefits across multiple accounts in your household. Amazon Household is, as the name implies, designed for families sharing the same residence and in a somewhat traditional family structure (two adults + up to four children). The two adults in the household each get access to free Prime shipping, Amazon’s Prime Video streaming service, an unlimited Prime Photos account (each household member gets their own account with private photos and albums), access to the Kindle Owners’ Lending Library for free books, and, of particular interest to those with small children, easy management of all the child profiles attached to the primary account. In addition, members of the household share purchased content across accounts: if you’ve bought a ton of books and your spouse has bought a ton of books, those books are no longer hostage on your separate accounts. You can share them with one another without having to buy them again. The same goes for audiobooks, apps, and games. In short if you already have an Amazon Prime account, there’s really no good reason to not take advantage of Amazon Household and share the benefits with your family. You’ll need, of course, an Amazon Prime account to share your Amazon Prime access. The fine print, however, means Amazon Household access is not available to those of you with discounted Student Prime accounts (you’ll need to pay the full Prime rate to get Amazon Household). Sharing is also not available if you’re a guest on another person’s Prime account and not the primary account holder–no surprise there, you can’t share what isn’t yours. The other adult member of your household will also need their own Amazon login and password if they don’t already have one (this login, of course, doesn’t need to be Prime-enabled). You do not need distinct logins for children as Amazon handles child accounts as profile-based sub-accounts of the parent’s account. Finally there’s one big consideration that really highlights how this is a service for families and not for friends, roommates, are distant relatives: when you link another adult’s account to your Prime account via Amazon Household, you also link all your billing information and payment options–the other adult in your Amazon Household will have unlimited access to any and all credit cards associated with the account. As such, it’s really only a viable option for spouses or other people with a shared financial situation. One small note before proceeding: in addition to the whole shared-credit-cards thing there is also a time restriction on creating and joining Households. 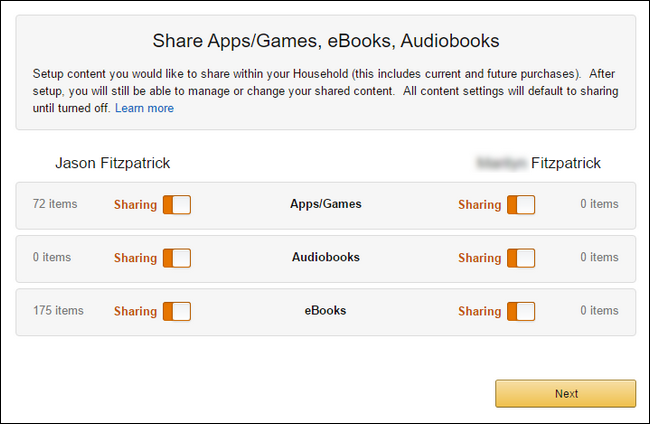 Amazon is really serious about making Amazon Household really for households (and not casual sharing among friends). When you add or remove a person from your household, neither you (the Prime account holder) or they (the previous Household member) can create or join another household for 180 days. The first step in setting up your Amazon Household is logging into your Amazon account. If you don’t know the login and password of the secondary household member (e.g. your spouse), you’ll want to grab them as you’ll need that information shortly. You won’t need any children present as all child profiles are linked to the parent’s account (unless you forgot their birthday, in which case you’ll need to awkwardly call them over too). Head over to the Amazon Household Manage Your Household page. Look for the “Add an Adult” button and click it. NOTE: if you used the old Amazon Prime sharing (the shipping-only option the preceded Amazon Household) your spouse might already be the other adult in your Amazon Household and you will be unable to add them. Instead of click “Add an Adult” click the link “Manage your Amazon Household” beneath the “Add an Adult” button. This will jump you right into the management panel that the rest of us won’t see for a few steps in this tutorial. 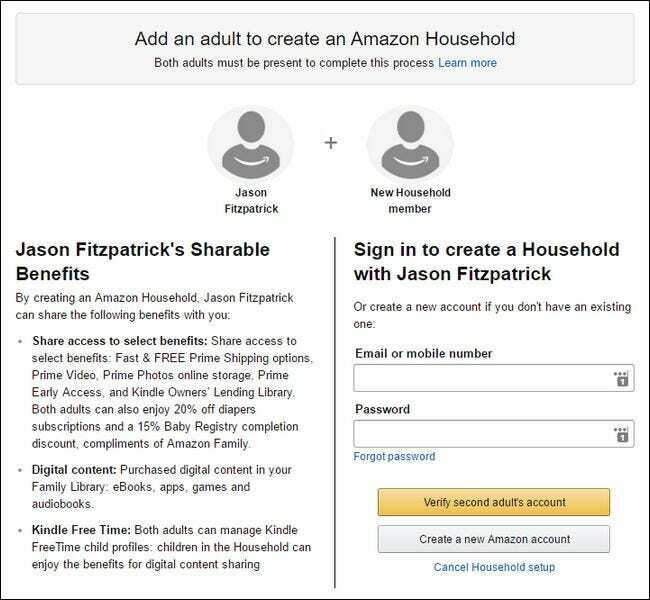 After selecting “Add an Adult”, you’ll be prompted to either 1) have them log in with their credentials or 2) have them create a new Amazon account, as seen below. After logging in the invitee, confirm you agree to authorize payment sharing by selecting ‘We agree to share…” and then click “Create Household”. On the next page you’ll be prompted to toggle certain sharing categories on or off. We’re not really clear in what kind of situation someone would be comfortable sharing their credit card data with someone but not their purchases but, hey, that’s your business. If you don’t want your husband to see that you’ve purchased an audiobook entitled “38 Simple Ways to Dispose of Your Husband’s Corpse” then now would be the time to turn “Audiobooks” sharing off, we suppose. In the next step you’ll be prompted to set a default credit or debit card for each adult. You can select from your existing stable of payment options, or add a new card. This step is specifically related to Amazon’s Prime Video sharing rules–you can’t use Instant streaming or sharing without a default card selected. You can actually skip this step if you wish (but you’ll be required to return and complete it later to share video between the two accounts). Once you’ve set your default payment, click next and you’ll be kicked into the main Amazon Household management page below. On the left hand side, you can review the members of your household including the second adult and the child profiles. On the right hand side, you can review your Prime sharing benefits, manage your family library (which is just the toggles we looked at two steps ago) and then jump to your content and device management page and your payment management page–more on the Family Library feature in a moment. 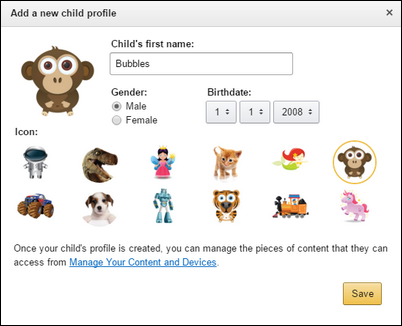 To add a child profile to your Amazon account, you use the same control panel we were just in. At the bottom of the left hand menu select “Add a child”. Enter the child’s name, birth date (relevant for age-based content), and select an icon for their profile. Click “Save”. The child’s profile will now appear in the sidebar. Although you can click to change the basic settings of the profile, the real power is found in the “Family Library”. Let’s wrap up the tutorial by highlighting how to use the family library function to share content with your children. In the previous section, we enabled content sharing between the two adults using blanket toggles: all audiobooks, all ebooks, etc. The content management for the child profiles is much more granular and you have to explicitly approve each title in your media library for access. To do so, navigate to Amazon’s Manage Your Content and Devices page. On the “Your Content” tab, select “Show Family Library”. After making the family library visible, select any book you wish to share by checking the box next to it. You can select as many books in one swoop as you wish. Once you’ve checked the books you wish to share, click “Add to Library”. Here you can select which person in your household you wish to share the books with. Using this mechanism you can selectively share age-appropriate content with your children. While this kind of granular sharing is really handy (and welcome), Amazon’s kid profiles really shine with the addition of a FreeTime Unlimited subscription. For a few bucks a month it turns your kid’s Fire tablet or Kindle into a super device with access to an unlimited amount of curated age-appropriate content. If you have a child under 12 years old or so, we highly recommend checking it out. You can even set it up on your Amazon Fire TV to lock your child into safe kid-friendly curated video content. 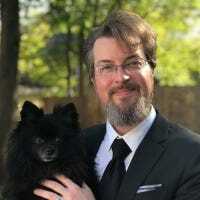 That’s all there is to it: as long as you have your household members on hand to help with the setup it’s an easy peasy process that pools your collective Amazon resources together.